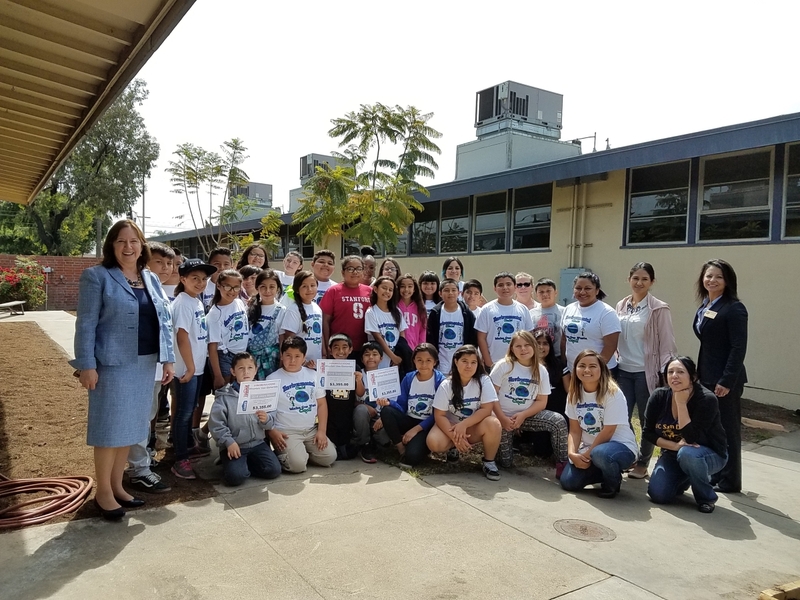 AZUSA, CA – Azusa Unified School District recently took a step forward in promoting environmental sustainability with the dedication of drought-tolerant gardens at two elementary school campuses on April 27. Serving as a model for the community, the completion of the Paramount and Mountain View Landscaping Water Conservation Project marks a new beginning in Azusa’s continuous efforts to enhance student learning environments. The Water Conservation Project was made possible by a $70,000 grant provided by the San Gabriel Valley Municipal Water District (SGVMWD) in August 2015. District administrators and members of the AUSD Board of Education joined Paramount and Mountain View students, faculty and staff to greet representatives from SGVMWD, Amigos de los Rios and Plant Goddess Landscaping to debut the gardens. The $70,000 grant was designed to create model drought-tolerant gardens in public places as part of a campaign to increase awareness of water conservation efforts in cities served by the SGVMWD. Paramount Elementary was chosen for the visibility of its prominent street-facing landscape, replacing an extensive lawn with a variety of water-wise flora. With its share of the grant, Mountain View Elementary beautified an area near the cafeteria and enhanced its student-maintained gardens. Plant Goddess Landscaping and Amigos de los Rios worked in tandem on the project, with Plant Goddess consulting on the plant selections and garden blueprints for each school. Amigos de los Rios purchased the plants and enlisted students, faculty and Azusa residents for a community ground-breaking at the schools on Jan. 21. The renovations became an opportunity for the Paramount and Mountain View students and their families to study environmental issues and learn the nature and importance of conserving precious resources. Students learned how California native plants save water and support native birds and insects. The garden project used California native plants, as well as other drought-tolerant species, including: California redbud, blueblossom, fragrant sage, California brittlebush, superstition mallow, alum root, salvia “Hot Lips,” Sesleria “Greenlee” and varieties of aloe. 05_17_17_AUSD_GARDEN1: Paramount Elementary Principal Hector Alegria and ASB representatives Bryan Ramirez, Alexis Rodriguez, Jacqueline Santana and Arianna Guillen pose in front of Paramount’s new drought-tolerant garden, made possible by a $70,000 grant provided by the San Gabriel Valley Municipal Water District. The garden, which features California native plants and succulents, was officially dedicated on April 27. 05_17_17_AUSD_GARDEN2: Mountain View Elementary School dedicated its new drought-tolerant garden on April 27, made possible by a $70,000 grant provided by the San Gabriel Valley Municipal Water District. The grant allowed Mountain View to enhance its student-maintained gardens. In May, the Mountain View Environmental Club broke ground on its new Sensory Garden. Mountain View Elementary School dedicated its new drought-tolerant garden on April 27, made possible by a $70,000 grant provided by the San Gabriel Valley Municipal Water District. The grant allowed Mountain View to enhance its student-maintained gardens. In May, the Mountain View Environmental Club broke ground on its new Sensory Garden. 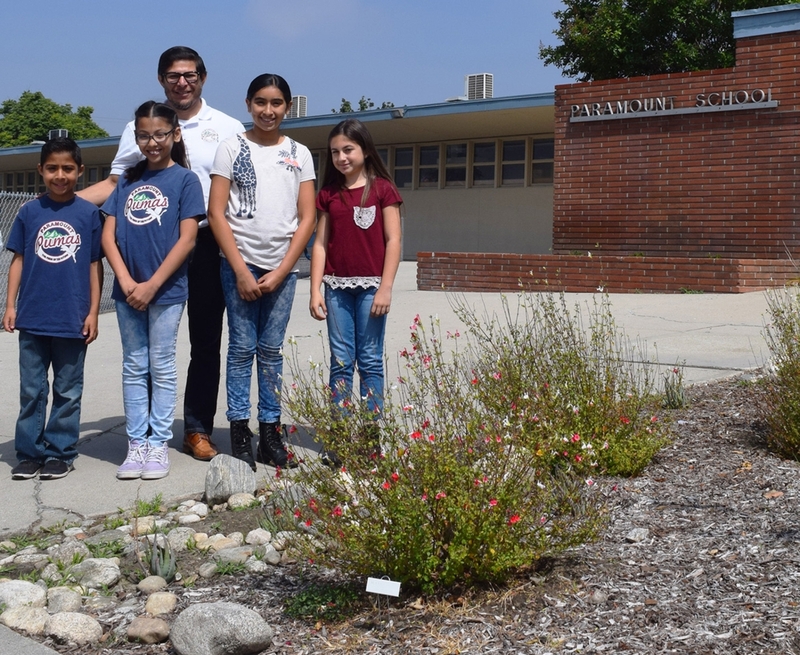 Paramount Elementary Principal Hector Alegria and ASB representatives Bryan Ramirez, Alexis Rodriguez, Jacqueline Santana and Arianna Guillen pose in front of Paramount’s new drought-tolerant garden, made possible by a $70,000 grant provided by the San Gabriel Valley Municipal Water District. The garden, which features California native plants and succulents, was officially dedicated on April 27.